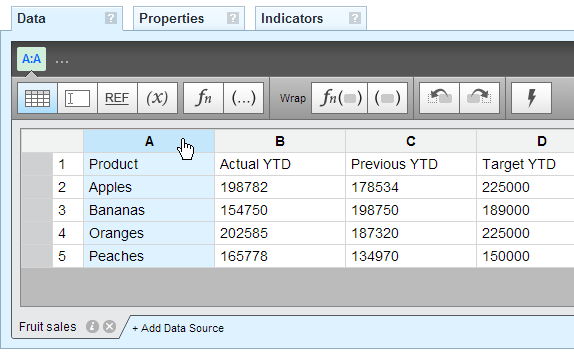 Working with spreadsheet data sources (Excel/CSV/tabular formats) – How can we help you today? Important Some functions and features used in Excel are not supported in Klipfolio Dashboard, and will return an error upon upload. To resolve this issue, remove all formatting from your Excel file prior to upload. You can work with spreadsheet data sources such as Excel and CSV files to build Klips. 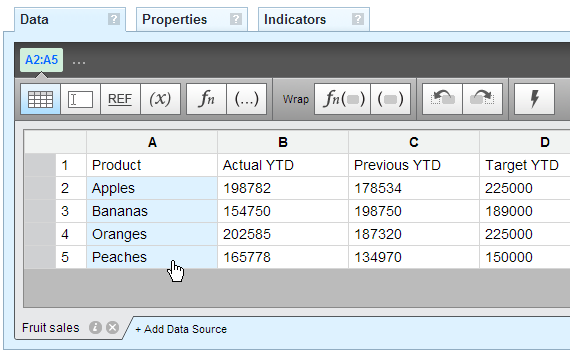 Using the Klip Editor, you can select values from your data source and use those values in functions and formulas. There are two selection methods used to assign data from your spreadsheet data sources to your Klips: 1) fixed range selections (A1:A4), and 2) unbounded range selections (A:A). This method allows you to assign a fixed range of values to your Klip (A1:E1). The Klip will always use the values from that range, even if the values used in that range change. For example, you select A1:A4, and the values in your spreadsheet are "A, B, C, D". Let's say the spreadsheet data is updated, and the values in A1:A4 are changed to "E, F, G, H", then those values will be used in your Klip. To make a fixed range selection, click and drag the values with your mouse. This methods allows you to assign an unbounded range of values to your Klip (eg: A:A, or 1:1). This methods tells the Klip to use any values in that column or row. 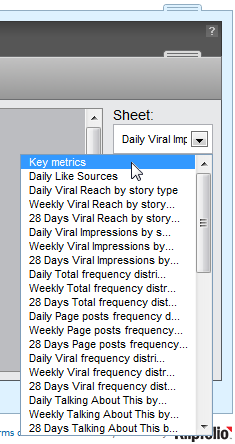 If new values are added to that range, they will be automatically included in your Klip. For example, you select A:A, and the values in the spreadsheet are "A, B, C, D". Let's say the spreadsheet data is updated, and the values in A:A are now "A, B, C, D, E, F, G, H", then all those values be used in your Klip. To make an unbounded range selection, click on the column or row header with your mouse. 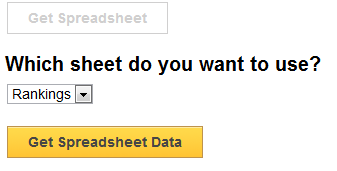 Any time you select data from your spreadsheet data source, an ellipsis ... will appear beside the data selection. Clicking on this selection will bring up a menu of math operators you can use to create a basic math formula. You can use Klipfolio's library of functions to manipulate your data selection. You can either click Insert a function button and then select your data, or you can select your data and then use the Function Wrap button. If your Excel spreadsheet has multiple sheets associated with it, you can select those sheets in the Klip Editor using the sheet selection menu. If your Google Docs spreadsheet has multiple sheets associated with it, you can specify which sheet you want to use on the data source creation page.